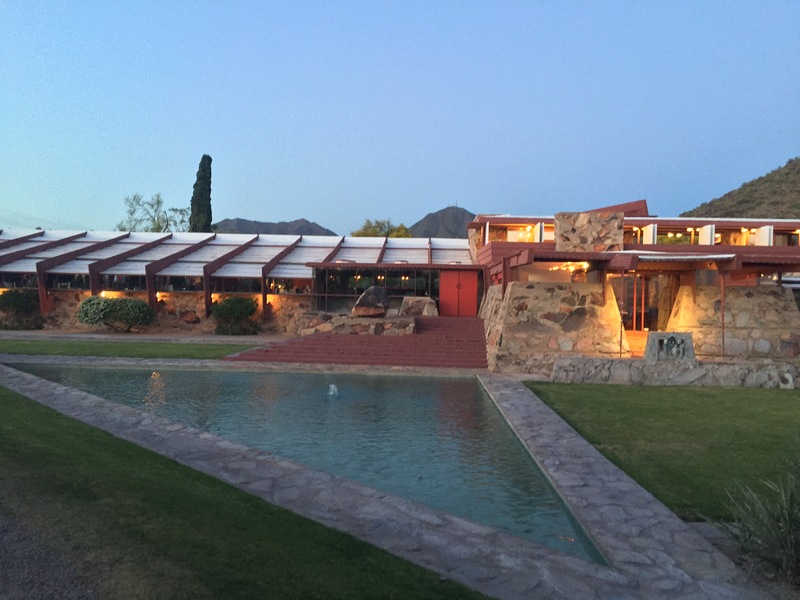 Taliesin West outside of Phoenix, AZ at sunset during the DOCOMOMO US Annual Symposium. It’s been six years since I launched Barbara A. Campagna/Architecture + Planning, PLLC and while many things have changed, my goal to work on “greening what’s already here” continues to be met, often in places I never expected. Many people are finding new ways to integrate historic preservation and green building practices, which makes my new venture a delightful and intellectually inspiring one. This is blog two of my sixth anniversary week. 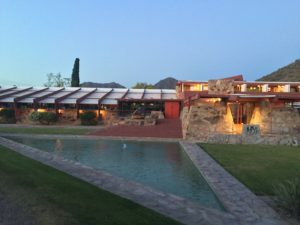 I had the great honor of being able to spend an afternoon and evening at Taliesin West as part of the DOCOMOMO US Annual Symposium. This spring we went to Phoenix and environs. Taliesin West is Frank Lloyd Wright’s winter home and school, where students can still study at his specific brand of architecture school. It was one of the most joyous experiences of my life. We had the entire site to ourselves. We weren’t forced on guided tours; we could roam around at our own pace. Sculpture, texture, color. We were there at sunset. Cocktails at sunset at Taliesin West with some of my favorite like-minded colleagues and friends. I think I will leave it there. (I apologize for the wonky formatting. I'm in the middle of renovating my website and everything is crazy!) For more photos, please view my Facebook photo album. You don’t need to be on Facebook to view it. And if you’d like to “subscribe” or follow my blog, True Green Cities, please sign up through the “Subscribe” button at the bottom left of this page. You’ll receive a daily recap when new blogs are posted. Or Sign up for the Feed, also at the bottom left of this page.